Whole berries from the black pepper plant. These berries are dried and ground into a powder and make up one of the main seasoning ingredients of many cuisines. Black peppercorns are made by picking the pepper berries when they are half ripe and just about to turn red. They are then left to dry which causes them to shrivel and become dark in color. Choosing: Look for peppercorns named after their point of origin.To ensure best flavor, buy whole peppercorns and grind them yourself in a mill just before adding to a recipe. In addition to superior flavor, buying whole peppercorns will help to ensure that you are purchasing unadulterated pepper since ground pepper is oftentimes mixed with other spices. 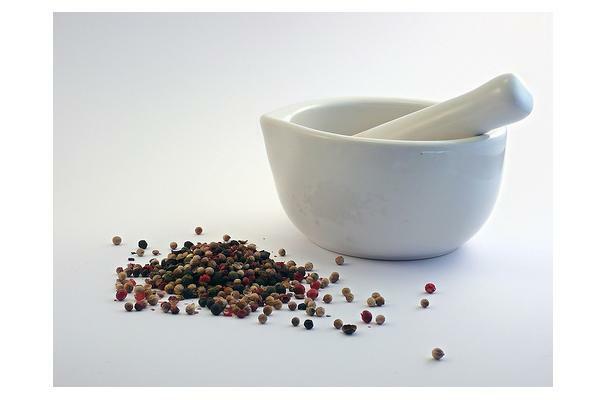 Whole peppercorns should be heavy, compact and free of any blemishes. Buying: Even through dried herbs and spices like black pepper are widely available in supermarkets, you may want to explore the local spice stores in your area. Oftentimes, these stores feature an expansive selection of dried herbs and spices that are of superior quality and freshness than those offered in regular markets. Procuring: Black peppercorns are picked from the vine just before they ripen and turn red. As they dry, the berries turn black. This particularly large, more mature, berry has a full, robust flavor described as almost fruity. Black pepper adds sizzle to meats, poultry, fish, sauces, curries, soups and stews; accents the natural sweetness of fresh shellfish; enlivens vinaigrettes, pasta, cheeses, pates, and vegetables dressed with olive oil or butter; underscores the sweetness of ripe fruit such as strawberries and pineapple; adds a touch of heat to cookies and other baked goods; marries well with chocolate. Whole peppercorns will keep almost indefinitely, while ground pepper will stay fresh for about three months. Pepper can also be frozen although this will make its flavor more pronounced. Today, the major commercial producers of pepper are India and Indonesia. Additionally, in the Middle Ages the wealth of a man was oftentimes measured by his stockpile of pepper. History: Tellicherry whole black peppercorns are left on the vine longer so they develop a deep, rich flavor. Considered the finest pepper in the world, these extra-large berries come from the Malabar coast of India.